Experience matters. People decide within seconds whether your app or website is useful and engaging. Crafting a great user experience requires more than just visual design. Adobe XD is an app for doing it all — wireframing, visual design, prototyping, previewing and sharing. In this session, we will show you how to design and prototype a complete experience using the new Adobe XD. Learn tips and tricks to immediately be more productive creating a great user experience. -Crafting a design with Adobe XD. -Re-using assets from Photoshop and Illustrator. -Creating an interactive prototype from your design. -Previewing your experience on mobile devices. -Sharing the prototype with others to get feedback. -Handing off your designs to developers. 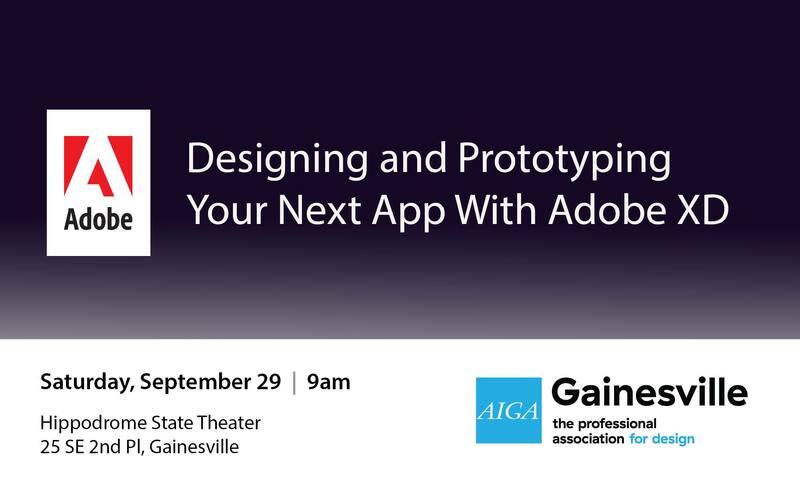 Join AIGA Gainesville and Adobe for an interactive workshop at the Hippodrome Theater. Attendees will be entered to win a 12-month subscription to Adobe Creative Cloud. Attendees should bring a laptop with Adobe XD installed. You will be learning from a trainer from Adobe and do not have to have any previous experience with Adobe Xd or with app design. Reserve your spot now, seating is limited.